Formerly known as the Eurocopter X3, Airbus’ patent-pending X3 hybrid helicopter could be the fastest forward moving helicopter in history. It took its first flight back in 2010 but has been a piece of work for the company as it battles out challenges to make the X3 the world’s fastest at speeds of up to 239 mph. This is made possible by a combination of a traditional motor for take offs and wing rotors that can be fired up during flight to give it the forward thrust it needs. 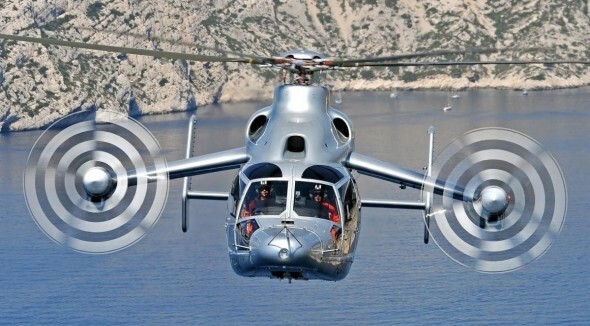 The speeds far surpass the fastest helicopter today, which does a modest 160 mph. The patent has been filed for a new design that sees the motors placed behind the wings resulting in lesser noise and vibrations. This also boosts passenger safety and does a word of good for the aerodynamics of the flight. Other features detailed out by the patent application include future turbojet engines, the absence of a tail rotor and the possibility of twin Rolls-Royce engines with 2,270 shaft horsepower (in each), powering the wing propellers. Team Sunswift sets the world record for the world’s fastest long-range electric vehicle!